lofieye uses historic photographic processes of photograms, solargrams and anthotypes to create quiet, thoughtful work in a contemporary context. Working with cameraless processes, imposes a gentle pace and ensures careful choices are made, culminating in unique, delicate images. Cameraless photography; using anthotypes (photosensitive emulsions made of plant life) and chemigrams. Mapping areas using found objects. Using found plant life to make photographic emulsions and print images. During ASMbly I will make images made with local plant life and use these to map the area around the ASMbly building. 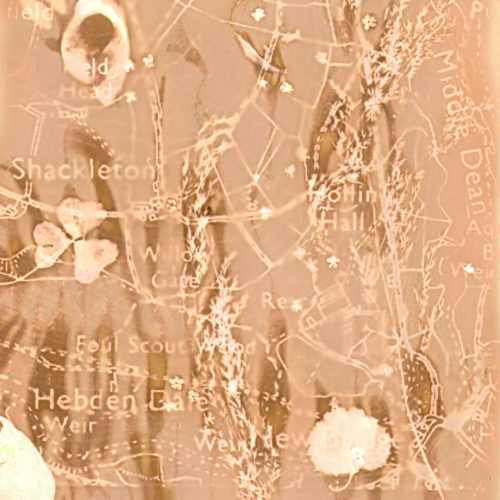 I am interested in recording the time spent in the area, the objects and plant life which are found and use these to create new maps as a permanent record of a transitory period. I am interested in meeting other makers/artists/scientists, particularly in chemistry and biology fields to refine and develop the ways that these records are made. chemistry and chemical lab knowledge, knowledge of extraction and identification of pollutants in found plants. Chemigram and photogram making, photography. Victorian Amputation Kits, Biomimetic Blueprinting.